Best Rated 80, 82, 85-inch and Larger LED 4K TVs – This page contains a roundup of the best-rated and largest LED 4K TVs available. These giant sized TVs are good for large sized living rooms. For 2018-2019 all manufacturers are introducing large 4K Ultra HD TVs, which have four times the resolution of Full HD. Large Screen 4K TVs are the best way to Watch 4K content, as you can sit closer than you could with regular HDTVs, for an immersive movie screen type experience. An 80-inch screen has over twice the image area of a 55-inch screen. Larger HDTVs are becoming more common, especially with high resolution 4K TVs. Click on the reviews link underneath each TV to see owner reviews and ratings for each model for easy comparison. A Glossary of Terms is located at the bottom of the page. 55-inch Vs. 80-inch TV = An 80-inch TV has twice the image area of a 55-inch TV. Larger screens give you a more immersive experience. With today’s TVs exceptional 4K resolution, larger is better. The current trend is toward larger TVs. 4K HDR = HDR or High Dynamic Range. This is the latest feature that actually does greatly improve picture quality. It allows for a wider range between bright and dark scenes, and makes colors look more natural. A true breakthrough in screen technology. Blu-ray discs and future content will be tailored to take advantage of this technology built into future TVs. HDR is included in most 2018 and 2019 4K TVs. Bluetooth® Audio = This will allow you to stream audio from the TV to bluetooth headphones, speakers, soundbars. 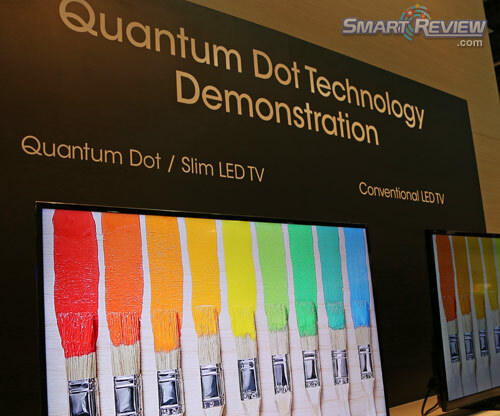 Quantum Dots = (Quantum Dots) technology gives enhanced color range and brightness. Quantum Dot TVs give higher dynamic range than normal TVs and are ideal for viewing HDR enhanced content. 4K TV = Many of the TV makers are transitioning from regular HD TVs, to 4K resolution TVs. 4K is 4 times the resolution of HD, capable of showing stunning detail equivalent to what you see on a movie screen, but on your home TV. Bigger sizes really shine in this format. 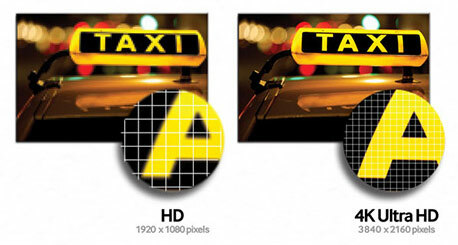 Regular HD has a resolution of 2 megapixels, 4K resolution has four times the resolution of Full HD. Native 4K content is available Netflix, Youtube, Amazon, Xfinity Cable, and DirecTV. 4K is also referred to as Ultra HD. 4K Blu-ray players with HDR are available. 4K Upscaling = TV will take lower resolution 1080p and 720p HD content and upscale to near 4K Ultra HD quality. LED HDTV = Instead of a conventional fluorescent backlight, these HDTVs use LED lights for backlighting. This dramatically improves picture contrast, colors, and overall picture. LED TVs also use about 40% less electricity. Full Array LED = A full array LED refers to the backlight of the LED TV. Most LED TVs are edge lit, or have the leds mounted on the edges. A full array contains many more LEDs, and are mounted equally in the back of the screen to give a backlight that has more uniformity without the flashlighting that sometimes can be seen on the edges. Edge Lit LED = The most common form of LED backlight. The LED lights are mounted on the edges of the screen. 120Hz = 120 hertz anti blur technology. Eliminates blur on LCD TVs during high action sports and movies. ATSC Tuner = This allows you to hookup an antenna to the TV to view HD Stations in your area. If only on Cable or Satellite, you don’t need this. Smart TV = This means that this TV can provide content from the internet. Content varies with the manufacturer. This TV will provide an ethernet port to connect an ethernet cable. Most manufacturers provide built-in WiFi for wireless internet. Smart TVs typically provide Netflix, Hulu Plus, Amazon Prime, Youtube, and Facebook content. DLNA = DLNA lets you remotely access your PC’s personal media so that you can download music, video, and photos and enjoy them anywhere in the home your TV is. DLNA stands for Digital Living Network Alliance and is a collaboration of the leading consumer electronics, PC and mobile companies that has created design guidelines for a new generation of products that can work together – no matter what the brand. HDMI = HDMI inputs allow you to connect devices to your HDTV such as DVD and Blu-ray players and game consoles.